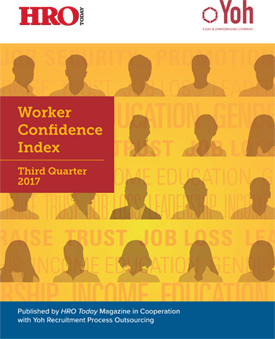 The Worker Confidence Index (WCI) for the third quarter of 2017 increased by 2.8 points after a significant drop by 7.9 points in the prior quarter. Of the four components of the WCI, likelihood of promotion rose the most, up by 3.2 points in 3Q 2017. The other components remained virtually the same. After a sharp decline in 1Q 2017, job security quickly rebounded, and now stands at 104.8, about where it was five quarters ago. Lack of concern about job loss is the most important indicator in estimating worker confidence about their current and near-term financial outlook. In addition, the rate of growth in the gross domestic product remains unchanged from the prior quarter.